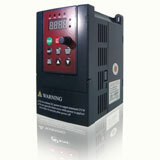 What is more important in a frequency inverter? Ac line reactor or a DC choke? If Ac line reactor is missing what are its possible impacts? What if DC choke is missing? Reactors add impedence which has the effect of reducing voltage when power is flowing. A DC link reactor will have the same effect on the operation of the frequency inverter as an AC reactor so long as the impedence is roughly doubles that of the AC reactor. The best use of an AC reactor is when the ratio of the mains supply and the inverter kVA is > 20. Example: You have a 7.5kW (~11kVA) inverter and a supply line capable of 1000kVA. The resultant ratio is almost 100:1 and results in a 'stiff line'. A voltage transient (voltage goes up) at the supply transformer can have a severe impact on the diode bridge, bus caps or both. An AC reactor will limit transients and prevent nuisance trips. A line reactor or a DC Choke (aka DC Link Reactor) performs roughly the same function if you are just looking at reducing line side harmonics a bit. Both will take the harmonics from 80-100% down to 40-50%, which is OK for a lot of applications. As noted on an earlier comment, the line reactor will help limit transients on the line side and reduce nuisance trips, while the Choke will not. Some existing frequency inverter designs come with a DC Choke as standard. It is either built in on the smaller ratings, or is added as a separate component typically on top of the inverter for the larger ratings. 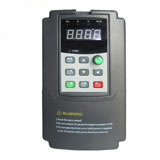 On these frequency inverters, you MUST USE THE CHOKE as the inverter's impedance without it is extremely low and it will not operate well without this additional impedence. (I don't remember if anyone ever told me what would happen if you leave out this additional impedence, but it must be bad. You can eliminate the DC bus choke if you add a line reactor on the front end, but the frequency inverter literally needs one, or the other, to operate well.